Generally, I love weekends. I’m glad they come around every week. When I woke up to the foreboding sounds of thunder and the patter of rain on the roof on the morning of November 2nd, I wasn’t too bothered. I didn’t have to go to work – I had something much more enjoyable to look forward to. This wasn’t just any Sunday. It was the day of Amy’s Ride. The inaugural Amy’s Ride would offer riders the opportunity of travelling to McLaren Vale along the Southern Expressway, as well as recognising and promoting the work done by the Amy Gillett Foundation. My riding preparations weren’t as rushed as they often are, given the relatively late starting time of 10.00 AM. I enjoyed a leisurely breakfast before starting to get myself, and my bike, organised. I’d been riding the 85 kilometre round trip to McLaren Vale for a few weekends prior to Amy’s Ride so I was feeling pretty good about the day ahead. I’d selected the 60 kilometre option which I think was wise. The rain stopped just before we put the bikes onto the car which was a good sign. 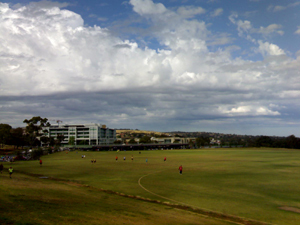 We drove down to Flinders University, passing riders all the way along Goodwood Road. Most of the vehicles we saw had bikes on the back. 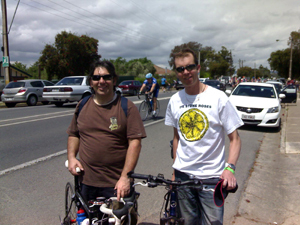 This was a big day out for Adelaide’s cyclists. The weather had improved by the time we arrived and I was confident that we would be more likely to need sunscreen than rain jackets over the course of the ride. Registration was well organised and we passed through without any fuss before catching up with the rest of our friends who were riding. Unfortunately we couldn’t hear the detail of the briefing as the acoustics were terrible. We picked up bits and pieces and, like the responsible cyclists we are, we’d all read the ride guide. Bells rang, the countdown commenced, and we departed on schedule. Our chance to ride the expressway had arrived! After a few minutes of skillfully negotiating a way out of the university grounds and onto South Road we joined the expressway. This was a great opportunity to enjoy a stretch of road that is ordinarily off-limits for cyclists. After a short climb I was looking forward to a long ride that would be smooth and fast. I felt sorry for the first puncture victim I saw – he was only a few metres into the initial climb. What a way to start your day! Mind you, I saw more punctures on this ride than I have seen on most others so it must have been the day for it. The climb to Majors Road was almost enjoyable – certainly it was nowhere near as difficult as the climb on the adjacent veloway (my regular ride). For anyone needing a distraction, a DJ and a devil, complete with horns and trident, had been strategically placed on the climb to give riders a rev-up. I was surprised to reach the top without breaking sweat and from there, well, it’s a lovely ride. Riding at high speeds on wide roads is a great feeling, especially when the only other vehicles present are bikes. Riders were swept along to the end of the expressway, most were happy to say hello as they passed or were passed, an indication of their level of enjoyment. We arrived at the right turn onto Main South Road much sooner than I’d hoped or expected. Once we’d left the expressway we had to climb a little along South Road. The climbs looked worse than they felt, and I was soon over the top. We were back in traffic so eyes and ears were wide open. At the refreshment stop at Moana I saw a few friends from previous rides. I only stayed for a few minutes but it was long enough to say hello and have a drink. 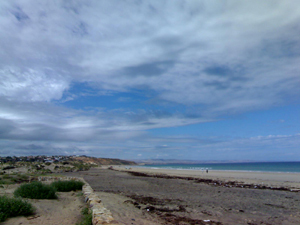 It was a beautiful beach and I took a couple of photographs. Back on the bike, I enjoyed the coastal views as I rode along the beachfront. I could see Rapid Head in the distance and I was reminded of my recent journey to Kangaroo Island on the Bicycle SA Annual Tour. Members of the public dotted the route, some looking out for friends and family, others just enjoying the spectacle. It was another pleasant aspect of the ride. The most arduous part of my short journey was the slog along Hahns Road. Whether it was the slight incline, the wind, or just me, I don’t know. Suffice to say I was glad when we hit the left-hand turn at Almond Grove Road. As I was doing the 60 kilometre route, I decided that I wouldn’t stop at the Willunga food station. There didn’t seem much point, given I had less than ten kilometres to travel. 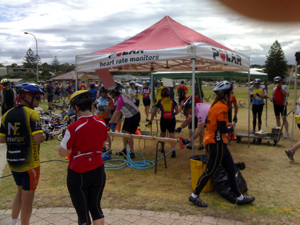 I pressed on to McLaren Vale, separating from the 100 km riders at the next junction. Friends of mine who had decided to tackle Willunga Hill on their road bikes told me later that the climb wasn’t as tough as they’d expected, and they’d felt pretty good as they’d climbed. Some of the photos I saw didn’t entirely bear this out but at least they’d climbed the hill and won. We entered McLaren Vale from the south of town, and I rode into the Visitors’ Centre just before 1.00. I was very satisfied with my ride. I found some of my friends and we happily chatted about our adventures. For the next hour or so I watched other riders drifting in, while enjoying the food and entertainment provided by Bicycle SA. My day had been great, my mates had enjoyed themselves, and the organisers I spoke with seemed happy with how it had all gone. Thanks to all the riders, organisers, volunteers, family and friends who helped make the first Amy’s Ride a memorable day out.